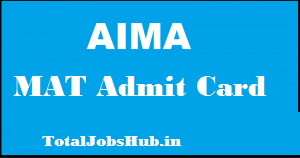 Dears Management students, kindly, avail AIMA MAT Admit Card 2019 May exam from here. All India Management Association is all set to conduct Management Aptitude Test for the MBA aspirants in May(Pen and paper Based) and (Computer Based Online Test) respectively. The examination dates are confirmed for which AIMA MAT May Exam Hall Ticket is going to be available from 29th April for PBT onwards. Kindly, check the further details and proceed to download your AIMA MAT Admit Card 2019 Download www.aima.in MAT May Hall Ticket. Proceed along further and read the recent news regarding AIMA MAT Admit Card 2019 details generated here. The applications have ended and the examination dates have arrived. This is to remind the examinees that this national-level selection test will be held in two days of May in an Online & offline mode. Please be prompt to check further notices top appeared on the mainstream media authenticated for public interactions. According to the recent updates, the hall tickets are to be uploaded to the internet media from April onwards. This competitive examination shall be organized at several locations for which the test is scheduled for the same time and date for all the exam venues. This competitive exam is based on a graduate-level questionnaire and subjective type questions. Check the exam pattern designed for this exam. The test shall be objective type in nature with a total of 200 questions (40 per section). The total time duration for this exam is 2 hours and 30 minutes. The language of this exam is English. Topics covered in the test are graduate level namely Data Analysis and Sufficiency, Language Comprehension, Intelligence and Critical Reasoning, Mathematical Skills, Indian and Global Environment. Contestants are instructed to carry two copies of their admit cards along with an original photo-id proof (Voter Card, PAN Card, Aadhaar Card, Passport, or Driving License). Be advised to reach the examination venue on time as mentioned on the AIMA Management Aptitude Test Hall Ticket. Latecomers shall not be allowed to enter the premises. Use of mobiles phones, smart-watches, calculators, wrist-watches, and electronic supports is restricted inside the examination halls. Entrants have to take care of their belongings on their own; authority shall not be responsible for any value being misplaced or lost. Locate the “students corner” on the homepage of the address. Follow a relevant link for AIMA MAT Admit Card May Exam in the section. Reach the login page to type your Registration Number / Application Number, Password or date of Birth. Press the Submit Button and generate a hard copy of your Ticket. Print additional copies of it to use it for reference. Take further support from these instructional steps generated above and hop on to visit the address mentioned hereunder. For more informational news about AIMA MAT Admit Card May 2019, please refer to the same link. Reach the author of this page by leaving your message in the comments box provided next below.